The First Official Flag of the Confederacy: Although less well known than the “Confederate Battle Flags”, the Stars and Bars were used as the official flag of the Confederacy from March 1861 to May of 1863. The pattern and colors of this flag did not distinguish it sharply from the Stars and Stripes of the Union. Christopher Columbus’ Fleet Ensign, 1492. The Castile and Leon flag is reputedly the first to have flown on American territory, since it was the one used by Christopher Columbus on behalf of the Spanish government who subsidized his journeys. 3 ft x 5 ft Columbus outdoor nylon flag. Digitally printed 200-denier SolarMax ™ nylon with white canvas heading and two brass grommets. Made in the USA by Eder. Flag carried by minutemen from Bedford, MA at the April 19, 1775 at Concord in the first battle of the Revolutionary War. 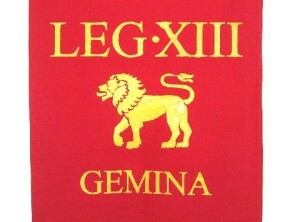 The flag features the arm of God weilding a sword with the Latin inscription “Conquer or Die”. 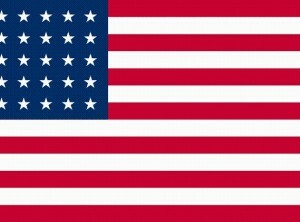 36 in x 45 in printed nylon flag with white canvas heading and two brass grommets. Made in the USA by Annin. Hand crafted in the U.S.A. by a Roman re-enactor, each of these unique flags is a representation of a flag (“vexillum”) carried by the Roman Legions that conquered the ancient world. Each flag is a large 20″ x 26″ linen-like cloth with 4″ wide heavy gold fringe. The design is a thick layer of yellow-gold paint hand applied through a screen to give an uneven imperfect rustic appearance like flags may have looked 2000 years ago. It is mounted on a natural wood dowel with braided gold hanging cord. Bennington nylon flag has sewn stripes and embroidered stars and “76” with white canvas heading and two brass grommets. Made in the USA by Annin. By 1520, Spainhad adopted a new national flag, as shown above. The saltire design, known as the Cross of Burgundy, was a symbol of Philip I, Duke of Burgundy and father of Charles I, who became Spain’s king in 1516. 3 ft x 5 ft Cross of Burgundy (Spanish Cross) nylon flag. Made of 200-denier SolarMax ™ nylon with white canvas heading and two brass grommets. Made in the U.S.A. by Eder. This is the flag that Columbus planted on San Salvador (Wailing’s Island) in the Bahamas on October 12, 1492. The embattled castle on the field of red represented the house of Castle and the red lion rampant on the white field represented Leon. This Spanish flag of Ferdinand and Isabella, reflected the newly united Kingdom of Spain. 3 ft x 5 ft Royal Standard of Spain outdoor nylon flag. Digitally printed 200-denier SolarMax ™ nylon with white canvas heading and two brass grommets. Made in the USA by Annin. 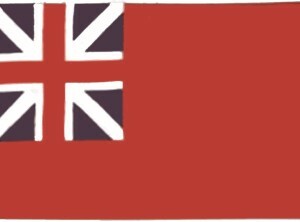 The British Red Ensign (aka Colonial Red Ensign or Meteor) had been used on British ships from the early 1700’s and was the flag used by the British during the Revolutionary War. Printed nylon flag with white canvas heading and two brass grommets. made in the USA by Annin.